Geist, Valerius. "Mountain Goat". The Canadian Encyclopedia, 04 March 2015, Historica Canada. 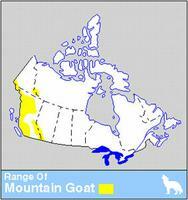 https://www.thecanadianencyclopedia.ca/en/article/mountain-goat. Accessed 24 April 2019. The mountain goat (Oreamnos americanus) is an even-toed, hoofed mammal of the cattle family (Bovidae), derived during the ice ages from the primitive Asiatic goat-antelopes. Mountain goat (Oreamnos americanus) (artwork by Jan Sovak). The mountain goat (Oreamnos americanus) is an even-toed, hoofed mammal of the cattle family (Bovidae), derived during the ice ages from the primitive Asiatic goat-antelopes. 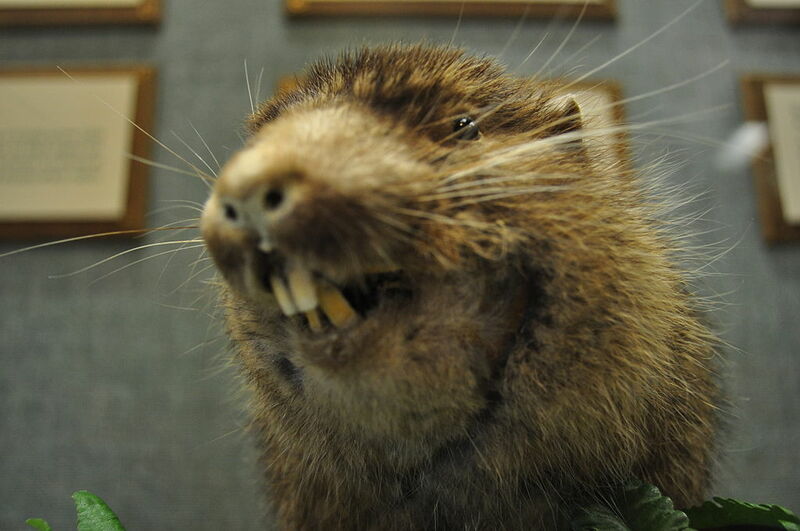 It entered North America during the last ice age from Siberia. It is not a true goat but belongs to a tribe ancestral to sheep and goats. 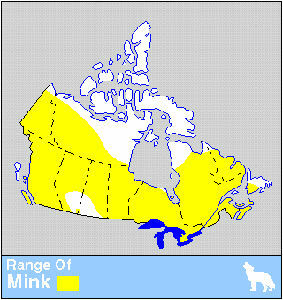 The mountain goat, largest and most cold-hardy species of its tribe, is widely distributed in the Canadian western mountains below the Arctic circle. Adapted to life on steep cliffs where footholds are often covered by snow or ice, it is a slow, methodical climber who prefers to move during daylight when there is good visibility. It may select resting spots for the night already in the afternoon. The mountain goats eyes are smaller than those of mountain sheep and are less widely set apart. It compensates for a narrow habitat preference with wide food habits. Males may exceed 125 kg; females weigh about 15% less. Both sexes have short, curved, stiletto-like horns that can inflict severe damage in rare but vicious fights. Male goats are protected by an exceptionally thick hide that, during mating season, swells on the haunches to a thickness exceeding 2 cm. Goats have thin, fragile skulls and do not clash head on. Adult males avoid combat if possible, relying on elaborate dominance displays. They normally withdraw from aggressive females. Adult females with kids dominate all other goats, including the largest males. They form loose bands in summer. In hard winters, such females with kids form a territory by evicting other goats from choice habitat; in mild winters goats remain gregarious. Males are dominant only at the peak of the mating season. Afterwards, they leave the female ranges or are evicted. One, rarely 2, kids are born in June and are carefully guarded by females. Natural predators include golden eagles, cougars, wolves and, rarely, bears. Wounded or cornered mountain goats have attacked human hunters. 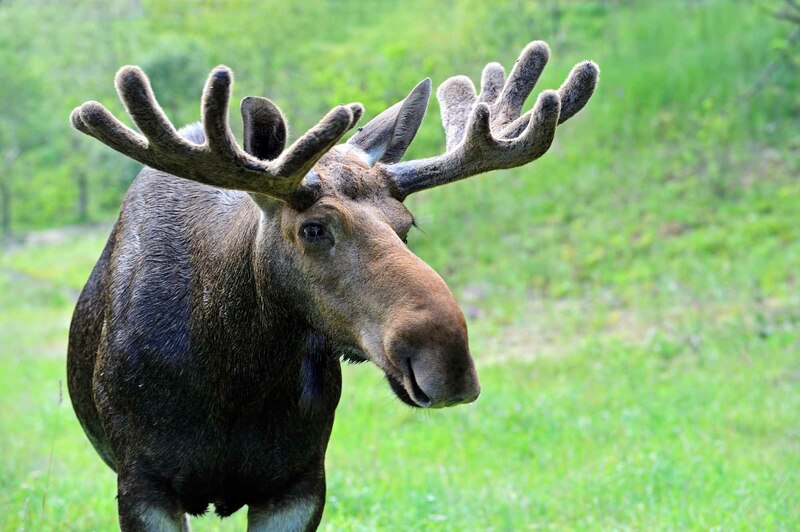 The meat of the males becomes unpalatable 2 weeks before the rutting season. Among coastal First Nations, mountain goat hunting was traditionally restricted to a few families. Hunts were highly ceremonial accompanied before during and after by ritual songs and dancing. The long fur was treasured and together with dog wool and cedar fibres was woven into artful blankets. The high commercial demand for these blankets drove goats to near extinction, but they were saved by the introduction of the Hudson's Bay blanket. 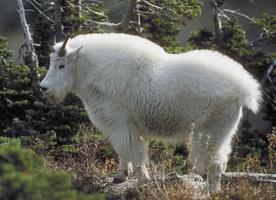 Mountain goats are adversely affected by disturbances and over-hunting. Their success in decades past was predicated on the absence of helicopters, snow machines, all-terrain vehicles and a monetary value for their carcasses.